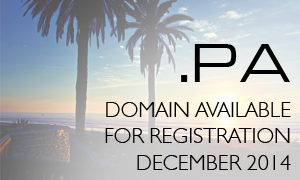 Holders of .COM.PA domains can currently register domains under .PA; General Availability is scheduled for December 2014. The national domain of Panama .PA is currently in the Grandfathering period during which only holders of an existing .COM.PA domain name which was registered prior to January 31, 2012 can register a matching domain name under the .PA extension. It is projected that .PA domain names should be available for registration by the general public in December 2014. If you do not qualify for Grandfathering registrations but are interested in a .PA domain name, please contact our Support Team at support@web-solutions.eu or via phone on +44 (0) 208 133 3994. The Republic of Panama is a country in Central America that borders with Costa Rica and Colombia, and is surrounded by the Caribbean Sea and the Pacific Ocean. The population of Panama is approximately 3.4 million and Spanish is the official language. The growing Panamanian economy relies heavily on the service sector, and is focused primarily on commerce, banking, tourism and trading.